For as long as I can remember, Sausage Rolls on the menu meant that it was a special occasion. Birthdays, graduations, and other special days were often celebrated with Mom's special sausage rolls. Preparation of these little pockets of goodness involved making dough, frying bacon - then draining and crumbling it, cooking sausage - then draining and crumbling that, too - and dicing up romano cheese. The advent of the microwave made the bacon preparation a bit easier, but these were still labor intensive little treats. As I moved away from home and started cooking for one, I often had the hankering for these little treats - but soon realized that a whole batch was a lot of work, and made way more than one appetite could handle. Then I started to use the freezer as my friend - I would cook a batch of bacon or sausage when it was on sale and tuck it, crumbled, into the freezer. The romano cheese, cubed up, froze nicely as well. And frozen dinner rolls were pre-portioned, allowing me to make just a few sausage rolls at a time when I had the hankering. Now that I am cooking for the family, I still use the freezer - although I have chosen to get fresh dough (or homemade when I can get Matt to oblige) - and have opted for pre-crumbled bacon. 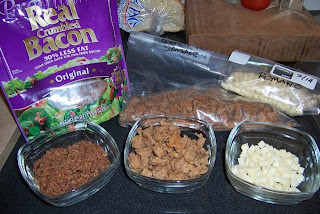 I portion out a bit of each of the bacon, sausage (Hot Italian is our preference - but you can use what you like) and cheese into prep bowls - as there is some cross contamination. I add more during the assembly process as needed, but try not to portion out too much, as it can't be put back (it usually gets nibbled in the preparation process, too). 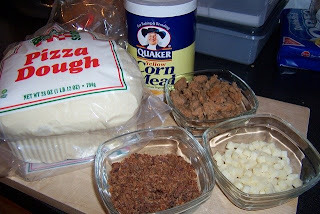 The only things you need are some dough (this pre-packaged fresh from our grocery store is the equivalent of most single batch dough recipes), corn meal, sausage, bacon and romano cheese. 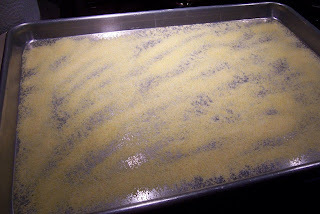 Prepare the pan by sprinkling liberally - very liberally -with corn meal. You don't want these little babies to stick. We prep them onto the pan and then move them to our pizza stone, but you can also bake them directly on a pan. You can make these any size you like, but I find that a "fingers" sized portion of dough allows for a good balance of dough and stuffings - too much bigger and your roll is mostly bread. 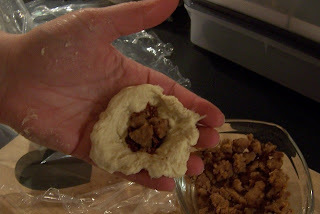 Too much smaller and your stuffings threaten to poke out of the dough. 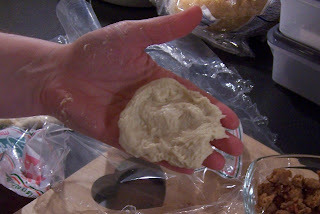 Stretch the dough out lightly and lay it on your hand. You don't want it to be too thinly stretched, as the bacon especially can easily poke holes through thin dough. Add a pinch of bacon. Then a pinch of sausage. 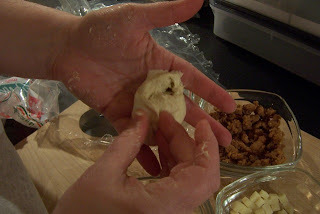 Pinch the sides of the dough together over the toppings, being sure to get everything enclosed. If you have cracks, the cheese will ooze out. 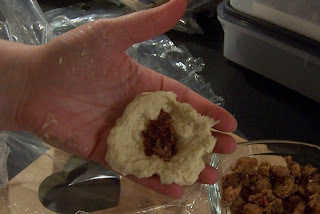 If the dough is drying out a bit, you may have a tougher time getting the sides to stick together. Sometimes stretching and pulling it a bit over itself will help. Sometimes you might need to dab on another tiny piece of dough to patch it. 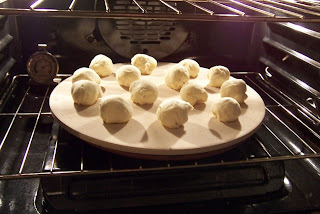 If you are "holding" your rolls on the pan and will use a pizza stone, then spacing on the pan is not a concern, but if you plan to bake these on the pan please be sure they are not too close together, as they will rise and expand. Bake at 500 degrees for approximately 7 minutes (longer if you are making your rolls larger) - all the inner ingredients are pre-cooked, but you want your bread to bake and your cheese to get warm enough to melt. 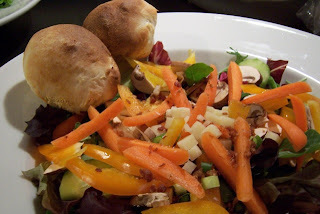 Tonight we served these along with a good hearty salad (note the "leftover" romano chunks sprinkled on top of the salad - that's where the extra bacon crumbles ended up, too). These are tasty good on their own, or dipped into pasta sauce. They reheat fairly well and make a good "meatroll" for a bag lunch. Cook and drain the bacon and sausage, allow to cool and crumble into small pieces. Dice the romano cheese into approx 1/4" cubes. 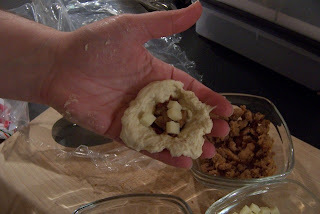 Stretch out small portions of dough into a palm sized circle, filling the center with a pinch each of sausage, bacon and cheese. Pinch closed. 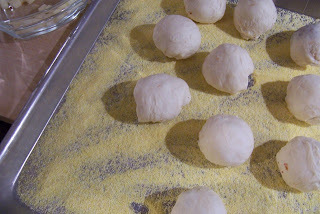 Liberally cover a baking sheet with corn meal and place assembled rolls onto sheet. 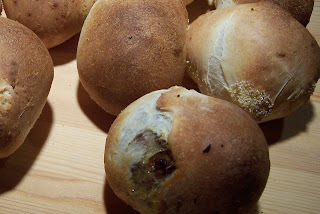 Bake rolls at 500 degrees for approximately 7 minutes or until brown. Eat cautiously - insides will be very hot. Experiment with different fillings and different cheeses - just be sure everything is on the 'dry' side (if you use spinach, for example, wring it out well to get most of the moisture out before adding it to the middle) - otherwise your rolls will be soggy on the inside. This is definitely in my top 5 favorite meals ever! I've always cubed Parmesan, but I'm thinking it's probably not that different than Romano. Last time I made them my dough didn't go as far as usual and I was left with way too many leftover toppings and too few rolls... so... I rolled the remaining dough out, piled in the toppings and made a stromboli-like giant roll. We sliced it with a pizza cutter after cooking. It was pretty good! Sometimes I dip mine in the salad dressing from my side salad. I know dad likes to put butter on them (not so sure about that one). They are definitely a hit--and the first food I taught Matthew how to cook back when we were in high school!